This is the most challenging day of the Ceredigion Coast Path, full of coastal drama and all of it is designated Heritage Coastline. There are several strenuous and repetitive climbs from sea level to the cliff tops and back again making this one of the most strenuous days of walking on the entire Wales Coast Path. You will however get the chance to rest up in one or more of the 3 of the cafes along the route, and there are pubs at Llangranog. Having left the little maze of streets in Dylan Thomas’s town of ‘Llareggub’. (If you’ve read this far, you’ll know to read it backwards), it’s a lung-busting start today, a taste of things to come, climbing up to Bird Rock (Craig yr Adar) above the town. 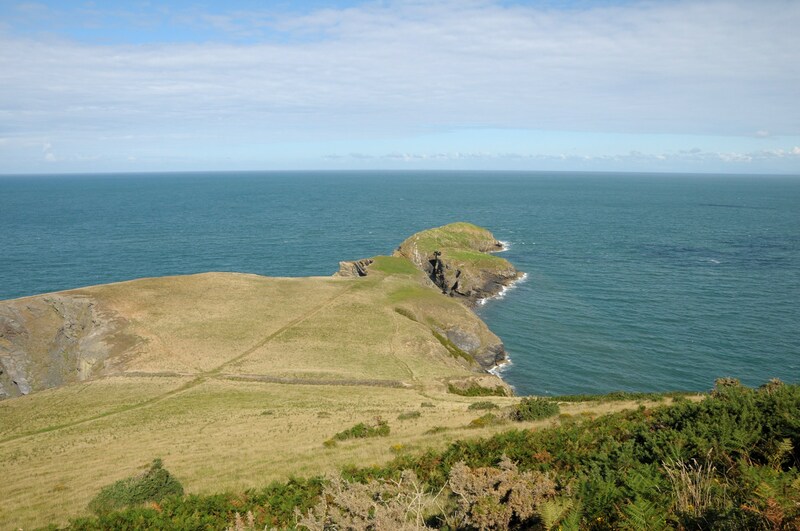 Make use of the lookout shelter just beyond the headland and above the cacophony and chaos of one of the largest and most significant breeding colonies of seabirds on the Welsh mainland. Over 4000 guillemots spend the spring and summer here, wheeling and crying in vocal competition with kittiwakes, razorbills, fulmars, cormorants and shags, all scrambling for a piece of the action and a perch on the narrow rock ledges in the high cliffs. You can get right up to cliffs on the headland for the best chances of spotting dolphin activity in the water below, whilst lying by the cliff edge surrounded by clumps of heather, thrift, campion and sea pinks, as you recover from the climb to get here! If it’s a clear day then from here you can see the whole of the North Wales coastline as far as Bardsley Island in the north, the peaks of Snowdonia and to your left, Cardigan Island and the flash of the lighthouse at Strumble Head in Pembrokeshire. You now descend to the jungle-like Craig Yr Adar Nature Reserve, an undercliff reserve where previous landslips have scythed through the landscape and left a rich, gnarled, woody forest growing from the debris, rich with wildlife and thick with undergrowth. It’s a very different environment to the rest of the day, entered through a glorious forest of bright yellow gorse. Hereafter, the climbs and descents become more regular, taking you above a fine beach at Cwm Silo, protected by having no road access and where the inland stream rushes to the sea over pristine sands, flanked by some impressive rock folds. Then, the remains of the Iron Age Castlell Bach fort -though much of it has been taken by the sea now, leaving contorted stacks and strata where ramparts once stood. This fort was home to a tribe of Celts who settled here in around 300BC and stayed for around 500 years. The breach in the huge cliffs at Cwmtydu is lovely, but little more than a few cottages, a very welcome café with fine cake, and a restored limekiln – all wedged into a narrow v-shaped wooded valley, where a stream gushes into pools and via little rapids to race across the shingle beach bar to the ocean. It’s a hidden spot, full of sea caves and caverns, so it’s no surprise that it became home to the most notorious smuggler along this coast, the much-loved Sion Cwilt, who stashed goods in the caves here until they could be safely taken inland by horse. These days, the most activity on the beach is at seal rocks - a breeding ground for grey seals. As well as seals you can see merlins here and sometimes spot salmon in the freshwater pools – and there are glow worms here as well. The next section gives a choice to walkers - those with steady nerves can walk along the sheer sides of the mighty Hirallt cliffs, on a narrow and exposed path which offers nearly two miles of superb isolation, adrenaline and drama. 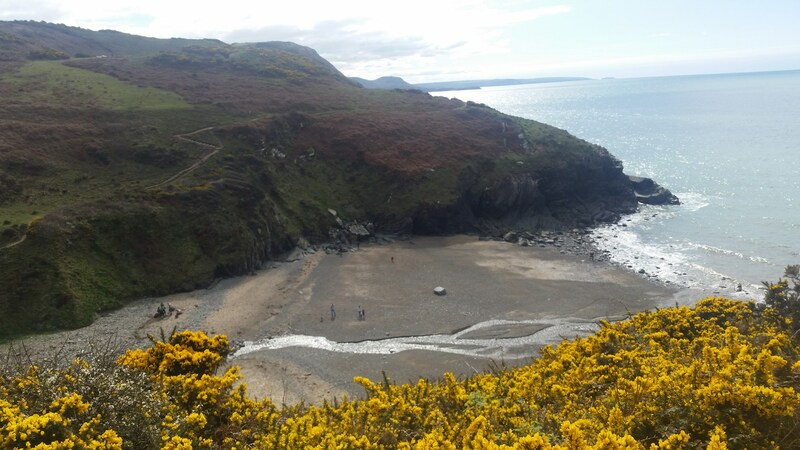 Those who don’t have a head for heights can opt for an inland alternative route through pleasant woodland and meet up with the main path nearer Llangrannog. On the approach to Lochtyn, you arrive via the huge fort at Pendinas, which controlled this area for nearly 1000 years from 500BC. A flat, table-topped coastal hill, it’s an imposing sight as you toil around its right flank. Like a natural beacon, the upper hill is often swathed in purple heather or yellow gorse depending on the time of year. This area is still home to the rare pearl bordered fritillary butterfly and work is ongoing to clear gorse to keep it attractive to the species. Below, sits the alluring, iconic headland and part-time island of Ynys Lochtyn, stretching out into the ocean, marked with long white quartz scars. It’s an outline that will be familiar by now, it’s the logo for the Ceredigion Coast Path which you see on every signpost for the entire 60 miles. Most people won’t have the time to walk the isthmus and explore the inlets and sea-arches, but you can at least view them from the junction with Pendinas. 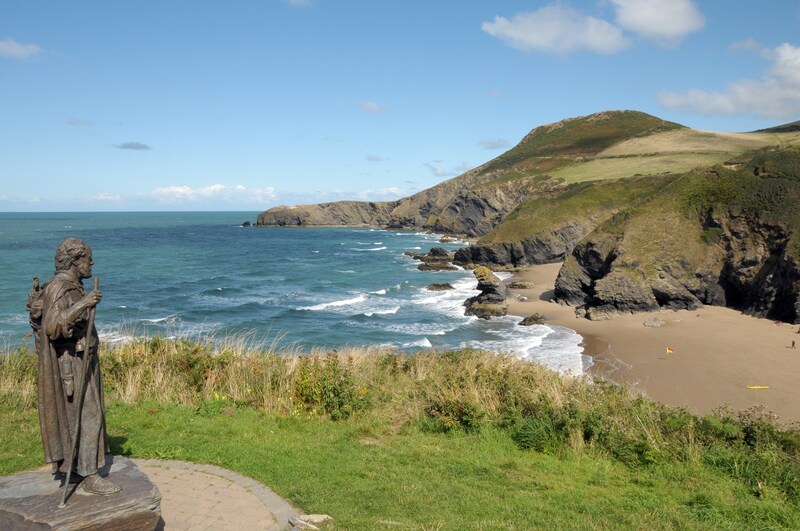 A headlong descent down the grassy cliff tops leads to everyone’s favourite beach village at Llangrannog. You are greeted by the cliff-top statue of Saint Crannog, a wise old pilgrim gazing over the pretty beach. He arrived here 1500 years before you and what he saw persuaded him to walk no more. Instead he set up his first church – and, well, who could blame him. The legend is that he saw a pigeon pick up a piece of bark and - deciding this could be a message from God - he followed it into the valley and sited the church where the bird dropped the bark. Saint Crannog has churches dedicated to him in places as far afield as Brittany, Cornwall and Somerset, so he got around a bit before arriving here and establishing his original church in the 6th century. 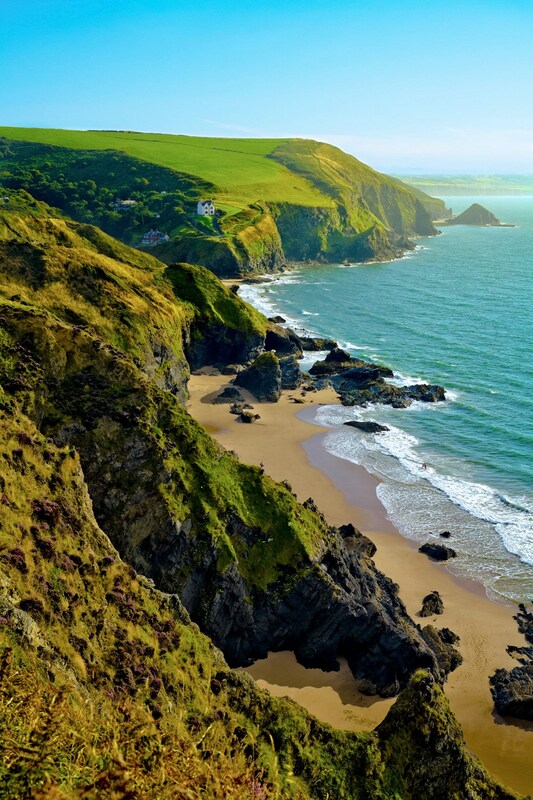 Llangrannog is a most welcome place for modern walking pilgrims, with its sandy beach peppered with rocky stacks and caves, backed by a sprinkling of friendly cafes and pubs that ensure that no one rushes through this place. When you do leave it’s to enter more breath-taking (in every way!) coast path, a stunning hidden cove and rock stacks appear below the Iron Age ramparts of Castle Bach at Traeth Bach (little beach). Here the brave and agile can climb down the cliffs, hunting grounds of peregrines, to beach level and witness another huge single-pitch cliff waterfall as well as pristine tide-washed sands where you will feel as solitary as Robinson Crusoe. Watch for butterflies as you pause to catch your breath - skippers, peacocks and tortoiseshell are prevalent here. Beyond, the path returns to its narrow traverse including the aptly named ‘steps of death’, dropping almost vertically through the gorse heather and bracken slopes – it feels like 100 steps down and then 100 straight back up! 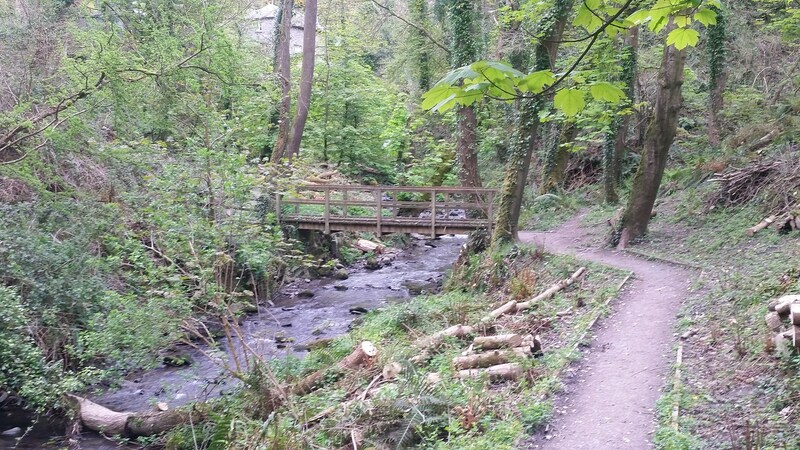 Finally, the effort eases as a gentle ancient trackway leads you to the lush deep wooded valley at Penbryn. This really is a little gem and quite unexpected compared to the rest of the day. Pause for cake at the little teahouse in the woods before plunging into the tiny valley where thick trees crowd out the daylight in a wildflower-covered stream valley that takes you back to the coast. Rich, ancient woodland runs high above the bubbling waters. It feels almost like a rainforest here with lush ferns, moss and tall trees. In a pretty glade, cross the stream below a vigorous waterfall and ascend wooden steps at the other end. There is a fine isolated beach for those that want it, accessed by the narrow ‘Robbers Valley’, a throwback to the location’s days as part of the Salt Smuggling Coast. It’s a short diversion from the valley to the little Church of St Michael and All Angels, said to be one of the oldest churches in Wales. It was on the beach here in 1817 that a French vessel carrying a cargo of wine was wrecked, leading to several deaths – not in the sea but due to overindulgence of the cargo rescued from the shore. 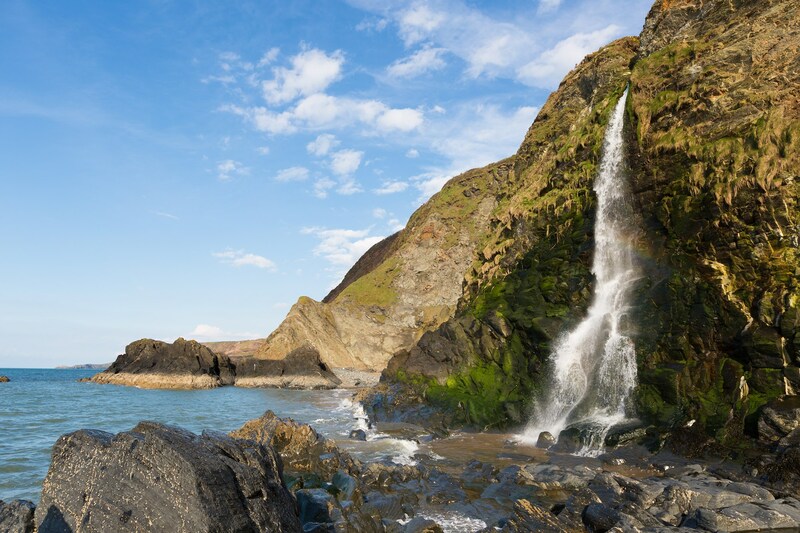 One final climb and descent brings you to the village of Tresaith and the end of the longest and toughest section of the path – if you walked all the way from New Quay you will no doubt be both elated and exhausted! The path descends steps to the inn above the little cove at Tresaith where there’s a fine beach, the highlight of which at low tide is the flamboyant waterfall that cascades into the sea from the end of the Afon Saith valley. Aberporth is now a mere skip away and to get there a rarity for the coast path - a surfaced trail prepared by United Nations Volunteers no less, a nice level walk alongside a rather bizarre line of old railway carriages that have been carefully renovated as holiday homes and which guide you into the twin beach town of Aberporth.